Eggs is aptly named. 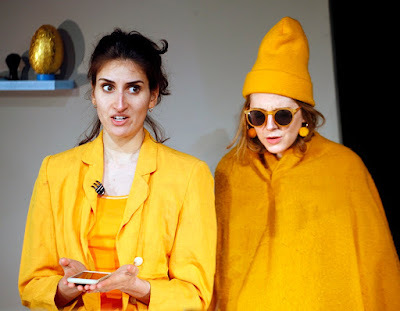 We open on an argument that vegetarians should eat eggs, one is obsessed with their conception as an IVF baby, egg props dot the scenery - even the costumes are color coordinated in yolky yellows and creamy albumen whites. It's a distinctive motif for a distinctive show. 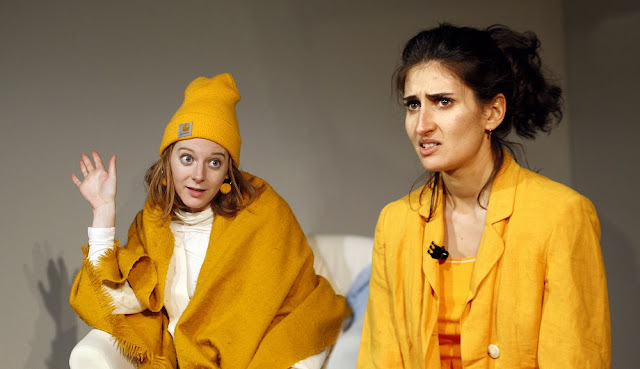 Written by Florence Keith-Roach (co-starring with Amani Zardoe) we follow the gently differing life trajectories of two university friends in their late twenties. It's an age-old split; one immersing themselves in boho studenty arrested development and the other deciding on a life of classical domesticity is the route for them. This relationship is explored through a chronologically scattered series of scenes. At first they appear a bit disconnected, functioning as mere skeleton for a series of comedy sketches. But as we get to know the two, we understand the fault lines in their relationship and how it informs their interactions. Crucially, by the time we've rolled into the final scenes, we care. There's a big ol' pile of stuff to praise here, and right at the top is Keith-Roach's straight-up magnificent writing. From scene one you can practically sniff the talent, and the audience perceptibly loosens up as we collectively realise we're in safe hands. Funniest parts are an examination of what it's like to have nits as an adult, a description of what it's like to go out with a pair of love eggs jammed in your knickers and a downright hilarious recounting of guilty drunken mutual masturbation. While the show has a firm grasp on easygoing farce, it also demonstrates bravery in going to dark places. There's precious few other shows in which one of the leads would graphically fantasise about violently murdering a pregnant woman and her foetus, and maintain audience sympathy. Then to cap that off with a top-class punchline? Out-standing. Underneath the good times is a sober and sincere examination of contemporary femininity. These women are being tugged in a hundred different directions at once; told that they've got be Barbie doll hairless to get a man, whilst simultaneously shamed for acceding to misogynistic beauty standards. They're expected to be nurturing, responsible mothers and also a demon in the sheets. Assertive in the workplace yet maintain a submissive feminine aura. All this bubbles away in a dramatic cauldron, Keith-Roach eventually zeroing in on fertility and the womb in an effort to decode the mystery: hence Eggs. Of course, a script this good is inert without the performances to match, so it's fortunate that Keith-Roach and Zardoe have the chops to do it justice. Both women are insanely charismatic and an absolute pleasure to watch. Keith-Roach has an excellent line in oblivious eccentricity, that gradually grows more and more tinged with pathos. Zardoe plays straight-woman, yet successfully conveys the goofier moments with aplomb. Both women match this with a knack for physical comedy. Attention to detail shines throughout, visible in the contrast between two women's body language as they stretch after exercise and during a late MDMA themed night out. The Vault Festival can sometimes be a bit hit and miss (though it's a consistently lovely place to be), but shows like this make the whole endeavour worthwhile. Everything, from the performances, the writing, the costuming - even the lighting and environmental effects - are ace. Eggs is an all round class act and an easy show to recommend. 'Eggs' is at Vault Festival until 6th March 2016. Tickets here.